It's difficult in today's camera market to find any beginner-level camera with a viewfinder. If you're a fan of the traditional 35mm film cameras, you're going to have a hard time duplicating that look in a beginner-level camera. But our GE X550 review shows an easy to use camera with a viewfinder. 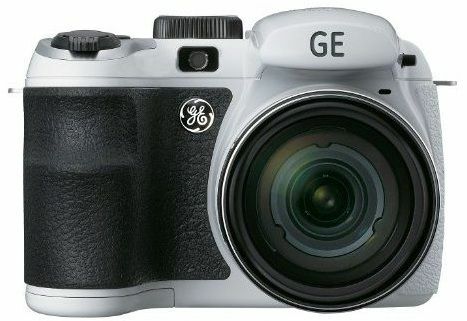 Although GE doesn't make cameras anymore, the GE X550 remains the camera that inexperienced photographers seek, thanks in part to its 15X optical zoom lens. Several performance issues detract from this camera, but its low price and viewfinder option make it worth considering. It'll work okay for a beginning photographer who has a set of needs that match the X550's strengths, but its drawbacks are significant enough to make it tough to recommend for every beginning photographer. Note: Although you still can purchase the GE X550 in a few locations, this is an older camera. If you're looking for the best ultra-zoom cameras that are newer models with better image quality, such as the Nikon P520 or the Canon SX50. Image sensor: CCD 1/2.33 in. Nice to find a beginner-level camera with a viewfinder. The camera is very easy to use. The 15X optical zoom lens is impressive. Running from four AA batteries is handy. The pop-up flash unit provides good results. Overall image quality could be better. The focus is not as sharp as it could be. The camera operates more sluggishly than is desirable. No HD video option is available. LCD quality and size could be improved. As with most inexpensive cameras, the GE X550 is going to do a decent job with color accuracy in outdoor photos. Indoor photos are a little better than you might expect to see with a low-priced model, as this camera has a pop-up flash unit that provides more power and better results than you're typically going to see with a flash that's built into the camera. The pop-up flash has a better angle to the scene than a built-in flash. If you choose to use a higher ISO setting, rather than using the flash in a low-light situation, you probably won't want to go any higher than ISO 800 or ISO 1600, or you're going to end up with excessive noise in the images. With 16 megapixels of resolution available with the X550, you should be able to make prints of a fairly large size with this camera. However, you may not be able to make those large prints as often as you'd like, as the GE X550's focus is a little soft too often. Some photos are sharply focused, but you're sure to end up with a really important photo that's too soft at some point, which will be very disappointing. Another problem that can affect the focus is the significant issue with shutter lag for the X550. The shutter lag will cause the camera to miss a sharp focus at times. Camera shake can cause some blurry photos when the 15X zoom lens is fully extended, too. If you have a tripod or have a method of steadying the camera, however, you'll achieve some nice images, because the 15X zoom lens will allow you to achieve some photos that you won't be able to shoot with a smaller zoom. Finally, video quality is a significant disappointment with this model. In a market where shooting HD video with a still image digital camera is common, the X550 is a rarity, as it cannot shoot in any HD video modes. Response times are very poor with the GE X550, even when compared to other sub-$150 cameras. As already mentioned, the autofocus mechanism tends to work too slowly, which will cause some soft photos and may cause you to miss a few photos. You're going to want to hold down the shutter button halfway and pre-focus on your subjects as often as you can to negate the X550's problems with shutter lag. This camera takes far too long to move from photo to photo as well, which is called a shot-to-shot delay. Because the X550 is sluggish in allowing you to shoot a new photo while it's saving the last photo, it can be very frustrating to use, as you're probably going to miss a few spontaneous photos because of the shot-to-shot delays. One area where the GE X550's performance is really good is in how quickly the zoom lens moves through its range. Many times, beginner-level cameras have poor zoom lens mechanisms, but the X550 doesn't suffer from this problem. Battery life is actually much better than expected with the X550. Typically, cameras that run from AA batteries don't do a very good job of conserving power, but the X550's four AA battery configuration will perform very well. GE did a nice job of including several power-saving features with this model, which is helpful. The GE X550 has a look and feel that's similar to another GE camera, the GE X5. It's a large camera and fits nicely in your hand. The large right-hand grip is great, too, although having all four batteries inside the handgrip can throw off the balance of this camera from time to time. Ultimately, if you're tired of those really thin cameras, the X550 is worth a look. The electronic viewfinder (EVF) that's included with the X550 gives this camera a very nice feature and a good look. You must press a button to switch between the LCD screen and the EVF, which can be a little bit of a hassle, but the viewfinder is a feature that you just don't commonly see on a model in the sub-$150 price range. We found ourselves using the EVF more often than the LCD the more we tested this camera, as the LCD measures only 2.7 inches diagonally and doesn't really have the sharpness we'd like to see. Another great feature of the X550's design is the inclusion of a mode dial by GE. Very few low-priced models offer a mode dial, which simply makes it easier for you to select the shooting mode that you want to use versus trying to make mode selections via the screen. There are two style versions of the X550: An all black model, as well as a white camera with black trim. If you like a larger camera, this model has a sharp look.